The first NZ Safari ride was in 1998 sponsored by BMW. The Safari was designed as a three day self-guided Adventure catering to dual purpose bikes large and small. The Safari came about from a suggestion by John Glasswell for a multi-day event to supplement the one day rides BMW were already sponsoring. The base route was designed to be ridden two-up even on large Adventure bikes. Optional more challenging loops were provided for riders to select according to inclination. Over the next decade we ran a further 12 BMW sponsored Safaris ending in 2005 with a four day event to celebrate the 10th anniversary. 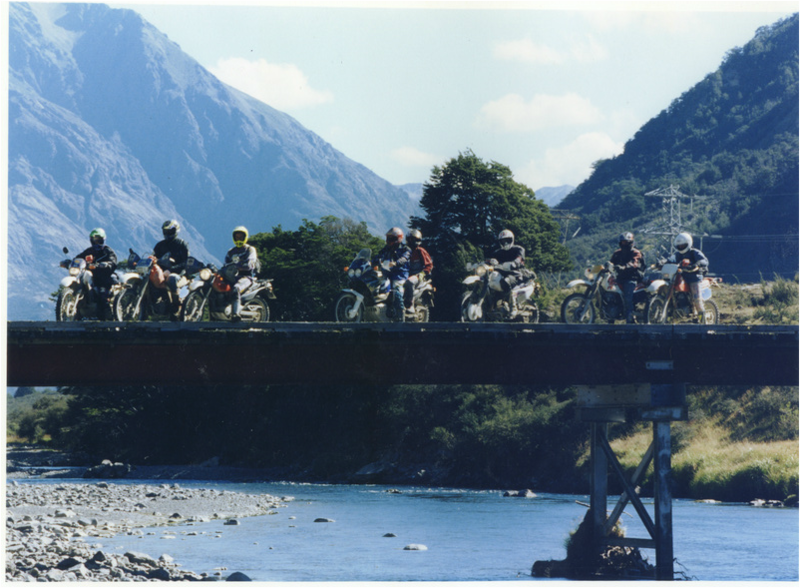 After a break in 2006 I resurrected the Safari with Yamaha sponsorship and in 2009 I passed on the organisation to Britton Adventures www.adventurerides.co.nz who continue to enthusiastically organise and promote the Yamaha Safari. This section contains archives from historic and current Safaris. Photos from earlier rides will be added over time. Riders on the 1998 BMW Safari pause for a break in the Rainbow Valley.